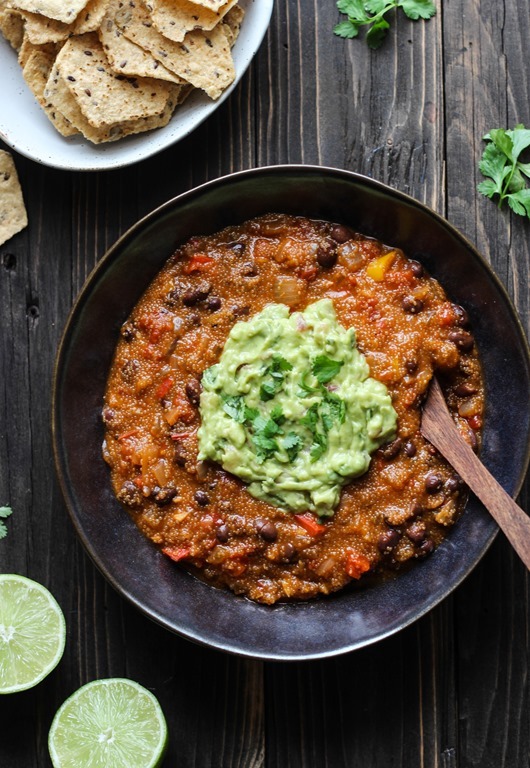 A flavorful one pot Mexican stew made with protein-packed amaranth. Vegan and gluten-free. I’m not even going to pretend like I watched or cared about the Super Bowl yesterday. I guess neither of the teams nor their deflated balls grabbed my attention. Sorry, I couldn’t help myself. I did use it as an excuse to make Mexican food though. I’m not sure why I associate the two, football and Mexican food. Maybe because the flavors go well with beer? It’s probably because I’m just all around obsessed with Mexican food. I can always count on there being some plant-based protein from beans and then avocados…they’re like my crack. Out of respect for the person’s privacy I won’t mention any names, but one time a family member of ours claimed that avocados raise your cholesterol. Because of my intense love for them, I felt so personally offended by that statement that it took all I had to contain myself. Thankfully it wasn’t an immediate family member so I decided not to argue and ended-up just nodding my head in agreement while resisting the urge to roll my eyes into the back of my head. But now every time I see an article or advertisement claiming that avocados lower your cholesterol (which they do, obviously), I have a nice little chuckle to myself. Anyways, as much as I would to talk about avocados ‘till the cows come home, we’re going to move on a lesser known food. Have you ever cooked with amaranth? It’s actually similar to quinoa because it’s also a seed (or pseudocereal/false grain) that’s extremely high in protein, calcium, iron and magnesium. 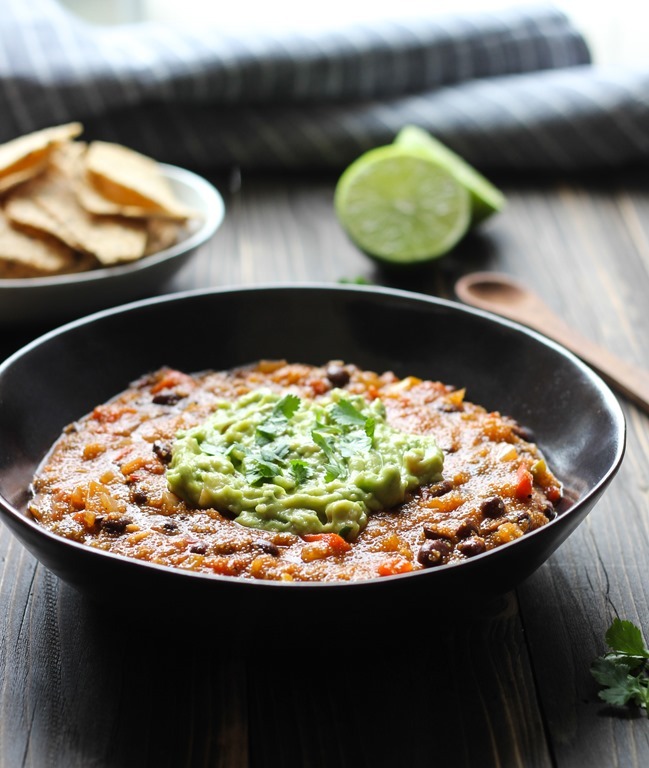 The flavor is slightly nutty with an aroma that’s similar to corn and it’s especially delicious when added to soups or stews, like this one that’s packed with spicy ranchero flavor. Now I will admit that the texture is a little different from quinoa. Amaranth is much smaller and expands less when cooking so the end result can look a little strange. Based on the fact that we eat with our eyes, I’m not expecting any of you to run to the store and buy amaranth today. Or tomorrow. 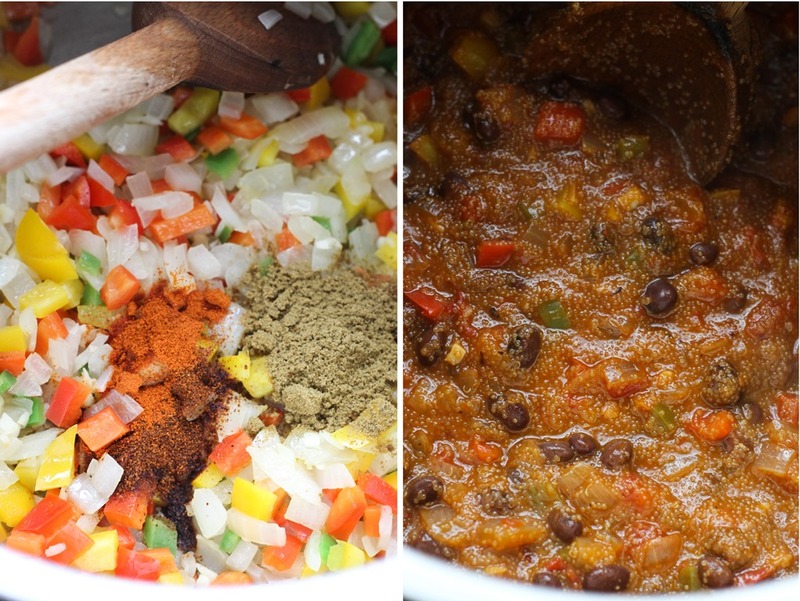 But for those of you that are brave and enjoy trying new healthy foods, this stew is a great place to start. The ingredient list might seem complicated but it’s actually really easy to make. And it only uses one pot which always makes me a happy camper. If amaranth looks too weird for you, you can use quinoa in it’s place. I’ve tried it and the result is almost exactly the same. But we really liked it with the amaranth so I hope I can inspire a few of you to give it a chance. You never know until you try! Warm the olive oil in a large pot over medium heat. Add the onion, garlic and jalapeno and cook for 5 minutes then add the bell pepper and the seasonings (cumin, chili powder and cayenne) and stir together. Pour in the vegetable broth and the tomatoes with their juices and then bring to a low boil. Allow to cook for 15 minutes so that it thickens slightly. Add the soaked and rinsed amaranth (or quinoa) and continue to cook for another 20 minutes. Next add the black beans, chopped cilantro and the juice of 1 lime and stir together. Cook until everything is heated throughout and then serve warm. Garnish with avocado and chopped cilantro and enjoy! *I prefer to soak grains to reduce phytic acid. This enhances digestion and absorption of nutrition.For this recipe, place the amaranth in a medium-size bowl and cover with 3 inches of water. If you have vinegar on hand, add a tablespoon to the bowl as well. Soak overnight or for 6-8 hours and then rinse before adding to the recipe. **I also recommend using a flavorful vegetable broth for the best results. My favorite is Better Than Boullion's vegetable base. I am still laughing imaging your facial expression when you heard about cholesterol in avocados. Ahahhaah, I am sure the situation challenged your patience! Amaranth… Sure, I have tried it. Did I like it? Kind of. Well, no, not really. It doesn’t taste that good to me but I reckon it’s healthy, edible (eh) and surely appropriate for stews where other ingredients take over. My mom has been trying to get me to try amaranth, but she wanted me to try the flour. 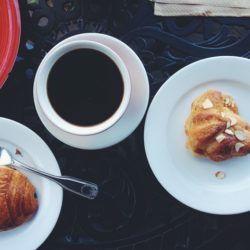 I think after seeing this recipe I will be giving amaranth a try. I’ve never tried amaranth, but now I’m intrigued! This stew looks pretty amazing. I wonder where someone got that idea about avocados?? Considering I ate my weight in homemade guacamole yesterday I’m glad it’s not true haha. This recipe makes me want to hop on a plane right back to Mexico! This looks perfect for this time of year when its freezing outside. And avocados raising cholesterol?! Yikes, pretty terrible statement. 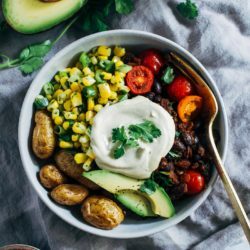 wow the flavors in this dish sound divine! and I’ve never heard of amaranth till now, thanks for sharing! I keep staring at the amaranth every time I see it, but always pass it up. I need to use up my millet and kamut (I’ve been experimenting with new grains/seeds), and then I’ll grab the amaranth! 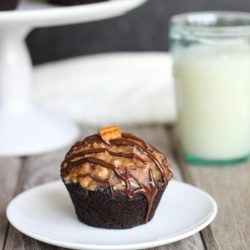 Definitely will be making this – looks delicious! Even if that were true about avocados, I would eat them :D I am eating with my eyes and this looks delicious to me! 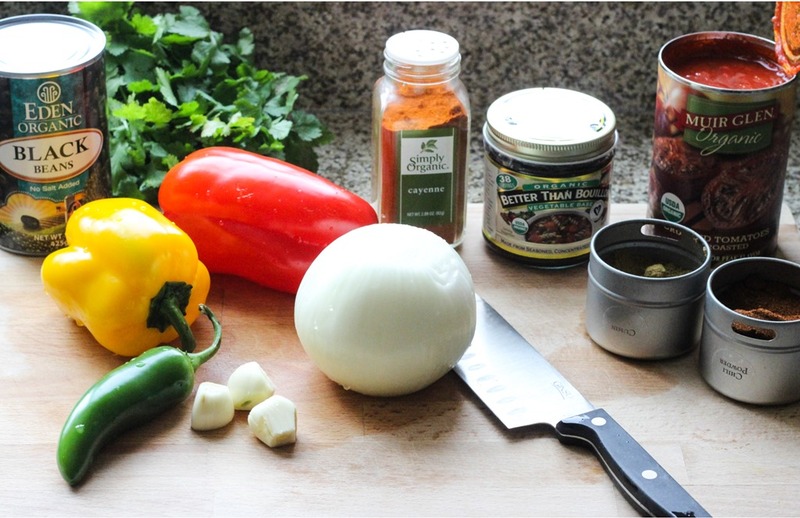 Definitely going to try cooking with amaranth soon – this looks so warming and flavorful. Mexican food is always a good vehicle for trying something new. I’ve seen amaranth (and seen it used on Chopped!) but I’ve honestly been a little nervous about giving it a try. This sounds good, so if my grocery store has it I have no excuses :-D I also have family members who have food facts totally wrong (and lots of facts in general wrong, if we’re being honest) — it’s caused many a fight at birthday parties and Christmas. I have trouble letting people be wrong, I wish I had your strength to bite my tongue! 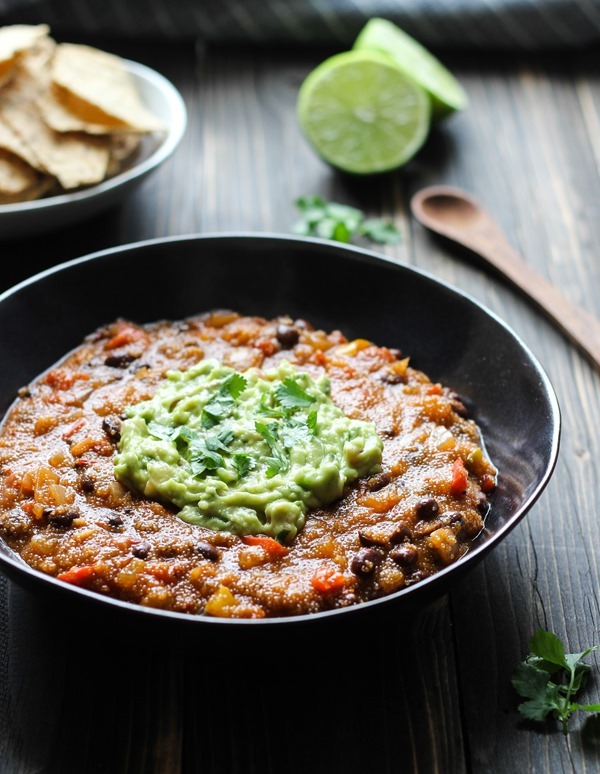 I totally agree about Mexican food being absolute heaven… but I think I mostly love it for the guacamole and salsa :lol: And can you believe that I’ve never cooked amaranth before? I have a baggie sitting in my pantry, unopened and probably expired by now. I kept meaning to get around to trying it, but I think it was just the tiny grains that threw me off? It’s definitely still on my to-try list! Yum yum yum, I’m with you on Mexican food… I mean beans, avocado, and cheese are all high on my list of favorite foods! Girl, I just rolled my eyes for you on that avocado comment! Seriously. And long story short, but I used to work for the USDA in college and managed a seed facility. Our job was to maintain seed integrity for a variety of seed genetics… one of the seeds I monitored for viability was amaranth :) So I have tried it and the texture is different but it is so good for you! You know me – I am alll about anything mexican, all the time! This looks fantastic! I’ve actually never cooked with amaranth before but now I feel like I need to very soon! 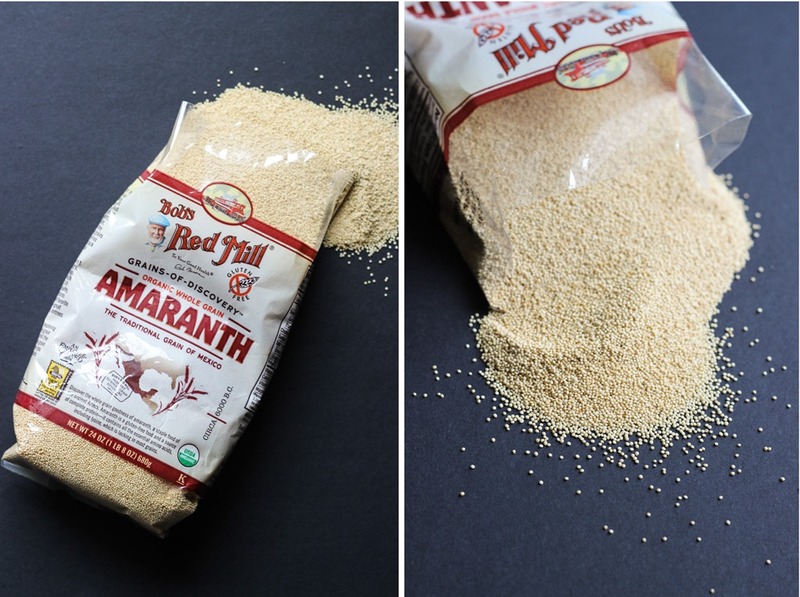 I’ll definitely be giving amaranth a try, as I love finding out about new-to-me grains. This dish is just gorgeous, and makes me want to go out and buy it now! Did you get it at Whole Foods or just the regular grocery store?? I have never tried amaranth, but I am really intrigued. Your stew looks so good. Plus nice and warm for this time of year! I will take a big huge bowl of this deliciousness right now. I have some amaranth on hand but have been too daunted to use it yet… so this recipe is just ideal for me. I have to make it! Are you being subjected to March Madness too like I am? I thought the super bowl was bad! I have been scouring Pinterest for a recipe for amaranth. Bought a boatload of it from BigLots, RedMill brand, then thought, ok, now what? Everyone wants to pop it, cereal it, or granola it. Was gonna make it tonight, but I’m soaking it first. Forgot that part. So, tomorrow I’m giving your recipe a go. Amaranth is just so awesome, I feel I need to include it in my new plant based diet. Thanks for posting this. Amaranth is a difficult grain to make savory because of it’s small size and texture but I was determined, haha! I hope you enjoy it! I made this today for lunch except I didn’t have any avacado and it was still delicious! This is the first dish with amaranth I’ve liked. Thank you! I was really skeptical when I cooked this recipe, because the first time I ate Amaranth I had a really bad experience with it ^^ I have to say that it doesn’t look too appetizing, but it tastes really good and I will definitely cook it more often, until I used up all the amaranth I still have at home :,D Thank you for this recipe! Pingback: Quinoa a healthy addition to food storage. I tried this recipe out, but it felt like it was missing a savory something. For example, I recently made a vegetarian Shepard’s pie, and added miso to the filling. That rounded it out and gave it that umami, rich flavor- I was very impressed with the result! Unfortunately this dish for me was bland. I don’t think miso would work here? I had to halve the hotness because my partner doesn’t like spicy, so perhaps it was that. But even adding more spice back in to my dish, I didn’t feel satisfied after eating a whole bowl, though I did feel full. I know it was very healthy though! Maybe you have a suggestion of what could be added to help? Hi Donna, sorry this recipe didn’t turn out to your liking. Exactly which spices did you use half of? The cayenne is the only one that makes this dish spicy. Everything else is mild and adds flavor. This was really tasty. 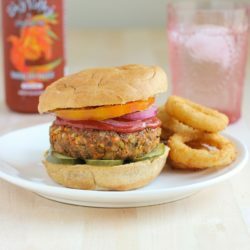 I’ve been looking for more vegan recipes to incorporate into my vegetarian diet. I used a boullion cube instead of broth and I didn’t use nearly as much cumin as I dislike the taste of it, and it still turned out very flavourful and fresh tasting, with the perfect amount of spice. I put mashed avocado on top like your photos, which gave the dish exactly what it needed to feel filling. Thanks again! I will definitely be making again. I used amaranth and will probably try it with quinoa too. I’m so glad you liked it, Zoe! Thank you! 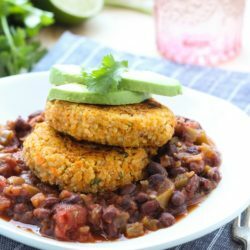 I was looking for a recipe with amaranth and this sounds wonderful, since it has two things I love: beans and avocado. I can’t wait to try it–and will do the soaking. Thank you for sharing!